Fylde RFC scored eight tries to win their first pre-season match 48-7 away to Kirkby Lonsdale at scenic Underley Park. They blitzed the home team with four tries in the first 12 minutes after centre Ralph Dowds opened the scoring in the first minute, having missed the whole of last season with a knee injury. Fly-half Greg Smith converted. South African-born wing/centre Lex Botha has joined the club while waiting to see if his application for a UK visa is successful. As yet he is ineligible to play in the National League but he has being given a chance to show his paces in the pre-season games. In the third minute he finished off a smart move with his debut try. In the eighth minute centre Connor Wilkinson picked up a loose ball in midfield, ran at the KL defence, chipped over the top and won the race to the touchdown. Smith added the extras for a 0-19 scoreline. Kirkby Lonsdale then had a period of pressure inside the Fylde half but were unable to turn pressure into points thanks to a stern defence by the visitors. Fylde battled down the pitch and in the 12th minute number eight David Fairbrother drove over the line for his side’s fourth try. Back came KL but fine Fylde tackling snuffed out the threat. In the 28th minute the visitors were back in the KL half and it was Wilkinson’s turn to set up a try for a team-mate as he offloaded neatly to lock Matt Garrod, who scored easily. Smith’s conversion extended the Fylde lead to 0-31. Fylde relaxed in the final 10 minutes of the half and KL took due advantage when they caught the visitors' defence asleep. KL took a quick tap penalty and drove over the line for their opening score and a half-time position of 7-31. Both teams made changes at the interval. Initially it didn’t seem to make any significant difference as Lex Botha picked up his second try a minute in to the second period. Play became rather disjointed, particularly from Fylde. KL came back strongly with a 20- minute period of pressure. They were unable to break down the visitors' defence and in the 69th minute Fylde extended their lead when full-back Tom Carleton skipped through a gap for a well-taken try. By this time, goalkicking responsibilities had been passed to replacement Tom Forster, back at the club after a three-season spell at Preston Grasshoppers. His conversion attempt was charged down. The final try was by Fylde’s most experienced player, replacement Chris Briers, and Forster added the extras. Fylde’s chairman of rugby Roger Banks paid tribute to the performances of the new players. He said: “I was impressed by scrum-half Cameron Crampton, prop Elliot Horner and the two Sale Sharks Academy players, youngsters Sam Dugdale in the backrow and Cal Ford at prop. And Lex Botha looked very sharp as well as picking up two tries. The Second XV match was abandoned at half-time following a serious injury to a KL player. 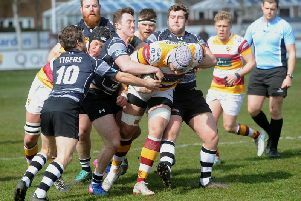 Fylde play their second and final warm-up match at home to Ampthill on Saturday before starting their National Two North campaign against Otley on September 1, also at the Woodlands.